Custom PC builder Cube is working closely with leading computer case manufacturer NZXT to take its configurations to the next level. A range of the newest Cube designs, exclusively available at Box, feature premium NZXT casing which integrates CAM software, to simplify installation and manage the use of RGB lighting and fans. The state-of-the-art technology helps the user to enjoy a seamless experience, from customising the PC through to installation and operation. The sleek all-steel construction is extremely sturdy, enabling ultimate protection for the elements within. The unique CAM-powered Smart Device digitally drives RGB lighting and fan performance, while Adaptive Noise Reduction optimizes the acoustics of the build through machine learning and settings. Gone are the days where you need multiple apps to keep tabs on your computer's performance. The highly advanced CAM software allows the user to keep track of key components' temperatures, overclock GPUs and display FPS in-game. Cube now has offerings in the most popular and limited edition NZXT Cases available. From the H400i to the H700i Ninja Edition case, Cube offers next day configuration options on NZXT Systems, so you don't have to wait around for new PC. There are also plenty of additional components available from NZXT, like the HUE 2, Aer RGB Fans, lighting strips, under lighting and some of the best CPU coolers on the market. Our Custom Configurator features the whole NZXT range, so you can create a fully NZXT themed system. 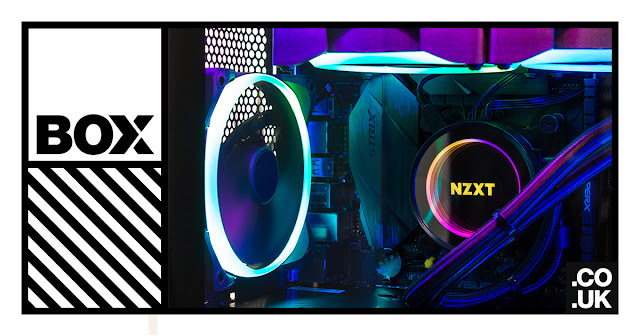 Right now, you can purchase an NZXT bundle for just £149.99 at https://www.box.co.uk/products/area/NZXTH400iBF. To customise a configuration that works for you, look no further than Cube PCs, exclusively available from https://www.box.co.uk/custom-built-pcs.